A burly dog named Bear awakened his new owner and her 9-year-old grandson after their Long Island house caught fire in the early morning, saving them before the smoke detectors went off, officials said. 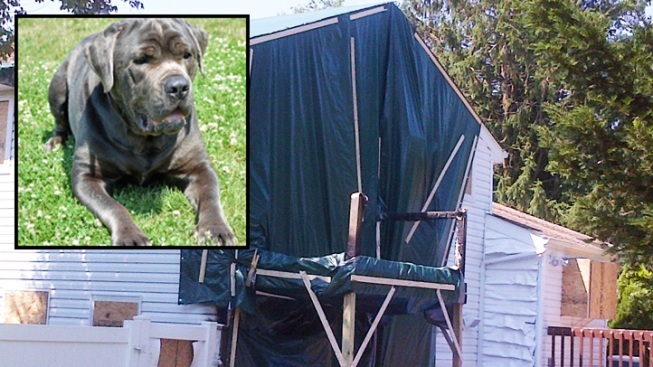 The mastiff mix, who had just been adopted by the family, jumped on the bed where retired NYPD detective Carolyn Swinson was sleeping, and when she woke up, she realized the house was on fire. Swinson grabbed her grandson and escaped the home. "That dog is a hero -- they were dead asleep but he woke them up," said Wilson Hidalgo, a neighbor. Brentwood fire officials say the cause of the Wednesday morning blaze is under investigation. It could be linked to faulty wiring on a pool filter, according to Brentwood Fire Inspector Rob Kuehn. Bear joined the family after he had been found wandering the streets in May, apparently abandoned by his owner. He was adopted July 5. Swinson said she rewarded Bear with some Kentucky Fried Chicken and a bowl of ice water.